GeMS/GSAOI K-band image of one of the three fields targeted from the Spitzer Extragalactic Representative Volume Survey. 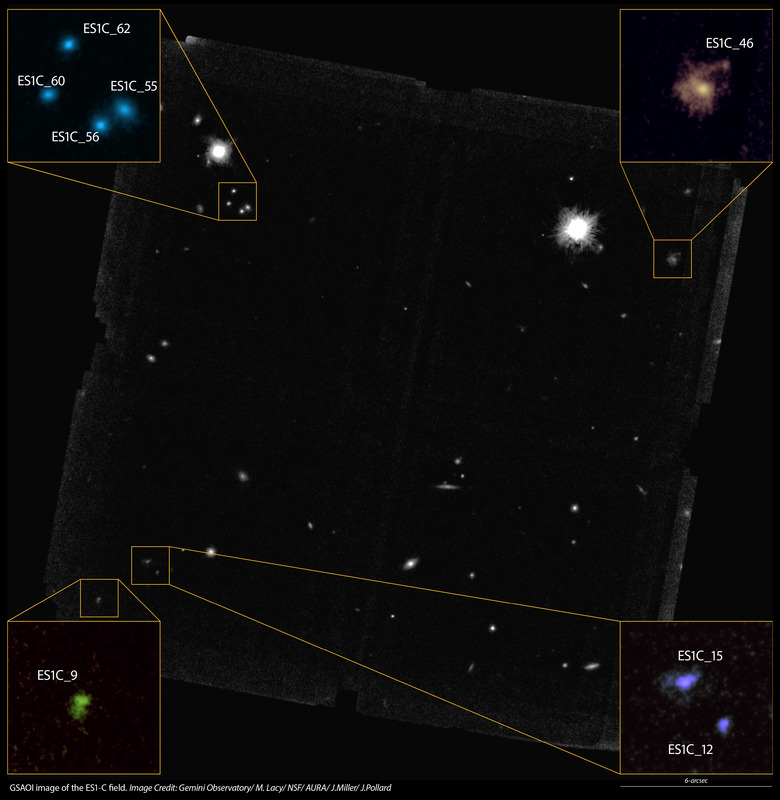 The insets show detailed views of several distant galaxies in this field. Multi-conjugate adaptive optics technology at Gemini South reveals that young galaxies, with large amounts of star formation, and actively growing central black holes, were relatively compact in the early Universe. A team of astronomers led by Dr. Mark Lacy (National Radio Astronomy Observatory, USA) used advanced adaptive optics on the Gemini South telescope in Chile to obtain high-resolution near-infrared images of three fields from the Spitzer Extragalactic Representative Volume Survey (SERVS). Their sample includes several ultra-luminous infrared galaxies (ULIRGs) which the Herschel Space Observatory found to be undergoing large bursts of star formation within the first few billion years of the Big Bang. Such galaxies have hundreds of times the infrared luminosity of a normal galaxy such as the Milky Way. The high-resolution GeMS images reveal that the ULIRGs have messy, irregular structures indicating that they are the product of recent galactic interactions and mergers. Lacy explains, “The fact that the disturbed morphologies of these galaxies persist into the infrared suggests that their appearance is not dominated by clumpy extinction from dust, but reflects the irregular distribution of stellar light.” Dust is highly effective at obscuring ultraviolet and blue light, but effects red and infrared light less. “These GeMS observations help reveal the physical mechanisms by which massive galaxies evolve into the objects we see today,” added Lacy. The team used the Gemini South Adaptive Optics Imager (GSAOI) with the Gemini Multi-Conjugate Adaptive Optics System (GeMS) to obtain K-band observations. Lacy’s team combined these Gemini data with other multiwavelength data at optical, far-infrared, and radio wavelengths to study the masses, morphologies, and star formation rates of the galaxies. The results of the GeMS study support previous results using the Hubble Space Telescope indicating that massive compact galaxies were more common in the early Universe than they are today. The fraction of galaxies with compact structures is even higher in the GeMS data, but it is unclear whether this is due to improved resolution with GeMS or a tendency to miss the more diffuse galaxies in ground-based images that must contend with the infrared glow from the Earth’s atmosphere. Some of the galaxies in the study also harbor active galactic nuclei (AGN), luminous central engines powered by supermassive black holes that are actively accreting mass. The researchers found that star-forming galaxies with AGN tend to have more compact structures than ULIRGs that lack active nuclei. The team also found what appears to be a rare triple AGN system, a close grouping of three galaxies with actively growing supermassive black holes that may be headed for an imminent collision. In the future, the James Webb Space Telescope (JWST) will enable studies at similar angular resolution and very high sensitivity at near-infrared wavelengths of large numbers of galaxies at these early cosmic times. However, the recent delays, and anticipated high demand for JWST, means that ground-based Multi-Conjugate Adaptive Optics systems like GeMS will continue to play an important role in targeted studies of rare infrared-bright objects in the early Universe. This work is published in arXiv.org.